Today's card features Grandpa and Me, another terrific image that can only be found on The Best of Just Inklined 2012 CD ROM. Regardless of the occasion, you will find something special on the CD perfect for the event! This is just darling! Brings back some wonderful memories! So beautiful Tammy. I love the image and the papers and embossing are fabulous. Awww..this is just lovely Tammy, what a great image, and fabulous colouring. The smiles are their faces are just the best. Wonderful card Tammy! What a lovely card Tammy!! This is just too sweet! Love it! Great textured background too. Fabulous card Tammy, I like the image and the fab colours. I like how you repeated the ripped edge on your card layers! Fantastic card and love the addition of the little heart! So pretty. Tammy, your coloring is just stunning! 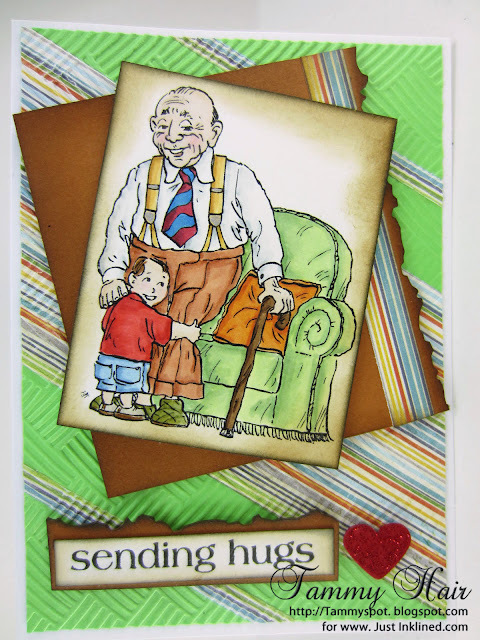 Great colors and textures on this fun card for grandpa!! Oh this image brings back so many memories - we lived across the street from my moms parents and I spent many hours over with Grandma and Grandpa. Great card! I hope they give you some profit because you are using those images on their CD and making it look so great! this would make any grandpa so happy!